There are rare moments when I feel like an artist. I stand back at something I've created and I think to myself, "Good job, ole boy." But then, usually not long after I pat myself on the back, I see a true artist's work and become quickly and completely deflated. Looking past my ego though, I just look in awe at the artist's work. 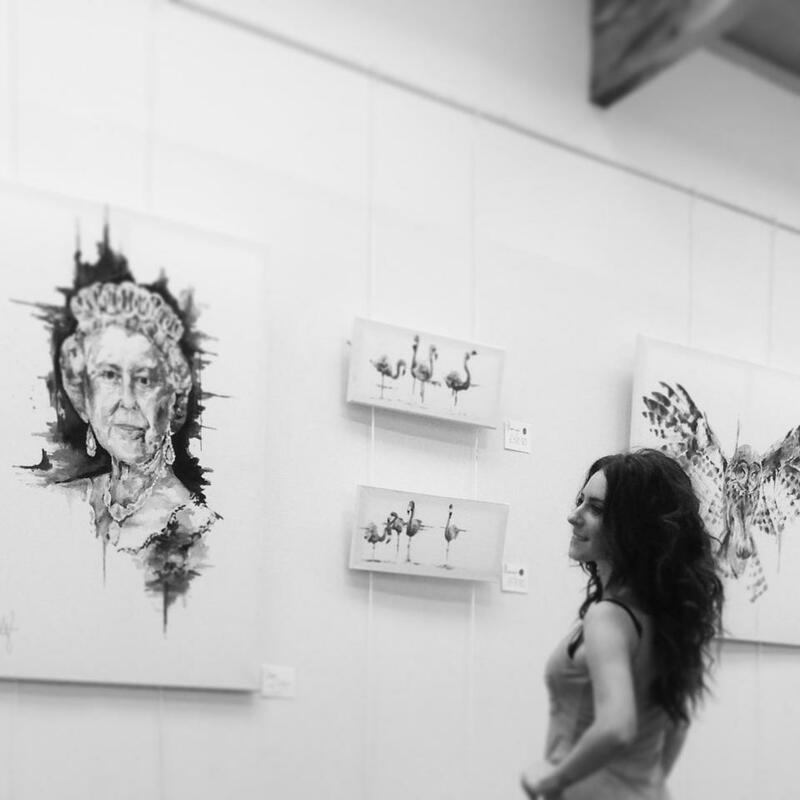 When I first saw Ms. Katy Jade Dobson's work I found myself in that same awe. And it was all just by chance since she had just followed me on Twitter. I then decided to look into her work and the awe continued with every piece I viewed. 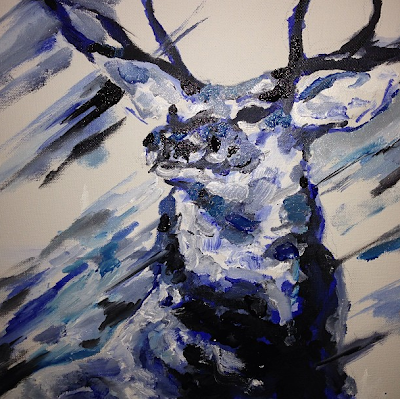 Ms. Dobson was born in 1988 and grew up in the northeast of England. She currently lives in Lincoln, UK where she initially studied art at a degree level. 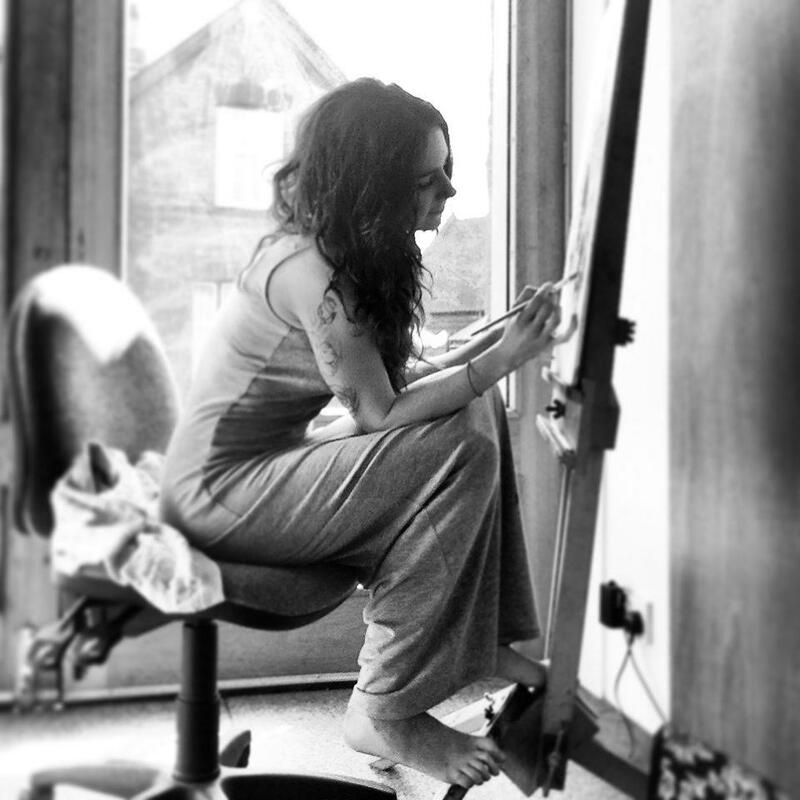 As her work progresses she learns to paint as she goes along. Her fine arts course became more of a contemporary art course to which she wasn't overly interested in. She has always loved the classic idea of a painting on canvas. 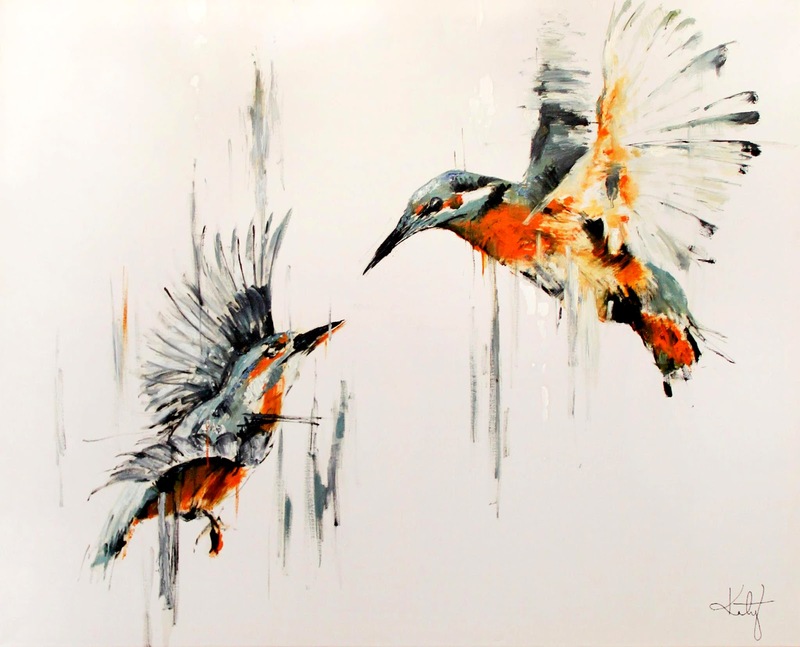 Her work focuses mainly on wildlife, portraitures, and landscapes. She also dabbles in photography and writing. And if that wasn't enough, she is currently learning the art of tattooing to which she says, "It's another form of expression, only different media and the essential patience of mastering a completely new skill." I was fortunate enough to communicate with Ms. Dobson about her art. Below is an interview about her work, style, and influences. What was your first finished piece? How did it feel to complete it? 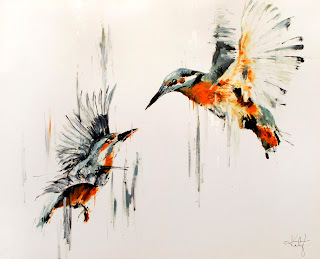 My first finished piece was a very large-scale mixed media piece of two birds in flight. It was the first time I had ever sat in front of a blank canvas with means to paint a painting or a piece of art work that was original and mine. I remember very clearly it was a strange process, very much unlike what it is for me to paint now as I feel so much assurity and conviction when I start my work. I remember it being an uncomfortable and strange process. I worked in sessions, adding parts and taking sections away. I then stopped for a while as it stood in the corner of my bedroom for a few weeks. After some time away from it but remaining in my peripheral vision I could see it was finished. I realized that art was instinctive and surprising; I learnt that when you stop for whatever reason you maybe know subliminally that you should not go further with it. This painting was the first piece I sold, I am very fond of it! When did art become a profession for you? Art became a profession for me just 8 months ago. I had been working in a job I was not overly happy in, and selling paintings on the side every now and then. When January 2013 came around I found myself in a situation where I was coming out of a bad patch. It had been pointed out to me that my artwork was going nowhere and this rang around my head for a few months. I found that a bad situation I had been in was a blessing in disguise, I took what I felt was a rock bottom and made a solid foundation of work that would be the starting point and portfolio that I needed. I then used my own money and resources available to me to get my work seen by as many people as possible. What attracted you to using oil paints? Using oil paints had been something I aspired to do for a while but I believed they would be too expensive and my work was too fluid and loose to be able to merge the two together. The first set of oil paints I bought were very memorable to me as I had earned the money through selling my artwork. 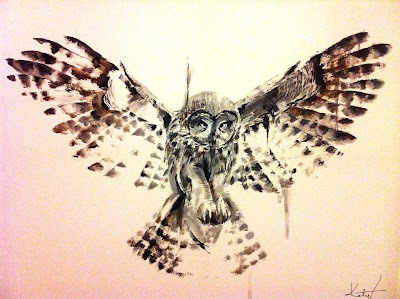 The first paintings I used oil paints for was a large-scale owl in flight (pictured right) and ever since I have fallen madly in love with them. The draw of oil paints was the rich quality they seem to have, the tonal depth they provide and the expressive and textured brush strokes. What other types of materials do you typically use? At the moment I haven’t used anything other than oils! I have continued to learn new ways to use them and I am still getting used to them. I believe it could be just oils for a while as there are so many different styles and appliqué to try! What other kinds of projects would you like to work on? Other projects I would love to work on are definitely with music (album artwork, etc.) as I have already been involved with a few projects that combine music and art; music plays such a strong part in my painting process. I would like to broaden my work to clothing items and/or bags. I think very laterally about where I would like to see my artwork and some ideas are rather abstract but my work is quite commercial and relatable so it could work on many different things. My main influence is Odilon Redon, when I was at college I worked on a project that was based around his use of colour. This manifested in my mind for years and years, it was only when I bought oils that this came to life. His work is incredibly ethereal and that’s the sort of image I see of my work before I start painting. It is not an exact reflection of life as you see it, but as suggestions and representative of power, movement and feeling. Do you have any upcoming shows or gallery events? I am currently working on a series of portraits of Iconic/Influential Women in which I intend to exhibit in 3 different places. I am not fully sure and confirmed with the venues as of yet however! The series sees £100 of each painting sale go to Women's Aid Charity and is a celebration of women throughout history that have made an impact in many different ways. Ms. Dobson is a perfect example of accidental discovery. She is proof that inspiration comes from anywhere, and of course that there artists hiding all around the world. It's a great reason to keep your eyes open. TRIVIA: The color palette for one of her paintings (below) was inspired by a restaurant menu. She loved the way the colors worked together and applied it to her work. She states, "It's how inspiration works!"